Each chapter includes an outline, summary, and example sets to help readers reinforce their understanding of the material. This book is designed to prepare graduate students who will be entering industry; researchers interested in initiating a research program; and practicing engineers who need to stay abreast of the latest developments in this rapidly evolving field. Elijah Kannatey-Asibu Jr., PhD, received his BSc from the Kwame Nkrumah University of Science and Technology, Kumasi, Ghana, in 1974 and his PhD from the University of California at Berkeley in 1980. He has been with the Mechanical Engineering Department at the University of Michigan in Ann Arbor since 1983. Dr. Kannatey-Asibu's research focuses on multisensor monitoring of manufacturing processes, multiple-beam laser processing, acoustic emission investigation of manufacturing processes, and microfabrication using femtosecond lasers. He is a Fellow of the Society of Manufacturing Engineers and of the American Society of Mechanical Engineers. SECTION I: PRINCIPLES OF INDUSTRIAL LASERS. 2.1 Standing Waves in a Rectangular Cavity. 2.6 Stability of Optical Resonators. 5.3 Comparison of Individual Mechanisms. Chapter 8: Types of Lasers. 8.6 New Developments in Industrial Laser Technology. Chapter 10: Heat and Fluid Flow During Laser Processing. 10.1 Energy Balance During Processing. 10.2 Heat Flow in the Workpiece. 10.3 Fluid Flow in Molten Pool. Chapter 13: Residual Stresses and Distortion. 13.1 Causes of Residual Stresses. 13.3 Effects of Residual Stresses. 13.4 Measurement of Residual Stresses. 13.5 Relief of Residual Stresses and Distortion. 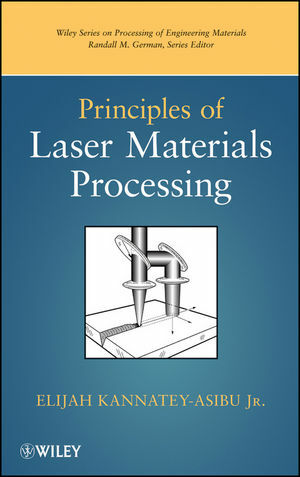 SECTION III: LASER MATERIALS PROCESSING. Chapter 14: Background on Laser Processing. 14.3 Disturbances that Affect Process Quality. 14.4 General Advantages and Disadvantages of Laser Processing. Chapter 15: Laser Cutting and Drilling. 16.3 Mechanism of Laser Welding. 16.6 Advantages and Disadvantages of Laser Welding. Chapter 17: Laser Surface Modification. 17.1 Laser Surface Heat Treatment. 17.3 Laser Direct Metal Deposition. 17.4 Laser Physical Vapor Deposition. 18.1 Principle of Laser Forming. Chapter 20: Lasers in Medical and Nano Manufacturing. Chapter 21: Sensors for Process Monitoring. Chapter 22: Processing of Sensor Outputs.